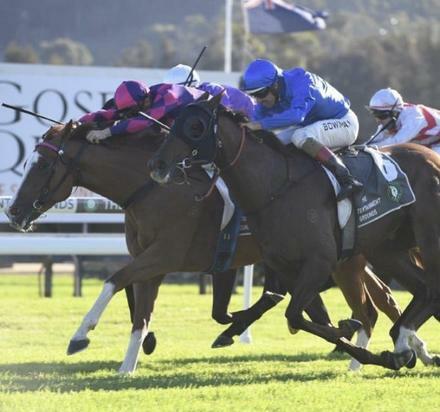 Kim Waugh Racing Stables :: Win no 7 to White Boots on Wednesday at Gosford! Well what can you say about our boy White Boots that hasn't been said before! The ever consistent handsome chestnut with four White Boots did it again, winning that is, at Gosford on Wednesday with Blake Shinn in the saddle! Settling one out one back, Shinn mindful that Boots was coming back in trip, took off 3 wide at the 600m to challenge the leader and as per usual despite Boots being headed half-way up the straight, he fought back like a caged lion to stick his beautiful big head out and grab victory in the shadows of the post! With a race record of 7 wins and 5 placings from 13 starts, it's no surprise Boots is a real stable star with the team at Waugh Racing! Congratulations to all his owners!